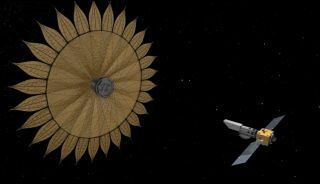 A sunflower-shaped 'starshade' launched to space with a simple telescope could help scientists on the ground hunt for another Earth. A protytpe "petal" for a giant starshade being studied by NASA for a future planet-hunting mission. The petals would unfold in space to block the light of distant stars so an accompanying telescope can attempt to directly image alien planets.